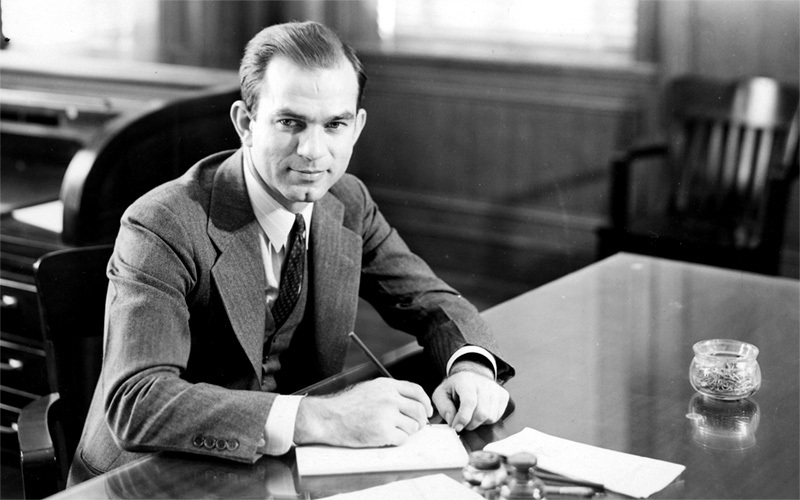 J. William Fulbright was born on April 9, 1905 in Sumner, Missouri. He was educated at the University of Arkansas, receiving a B.A. in Political Science in 1925. He then attended Oxford University as a Rhodes Scholar where he received a M.A. degree. When Fulbright returned to the United States, he studied law at George Washington University in Washington, DC. During the 1930s, he served in the Justice Department and was an instructor at the George Washington University Law School. In 1936 he returned to Arkansas and lectured in law. From 1939 to 1941, he served as President of the University of Arkansas, the youngest university president in the country at the time. Fulbright entered politics in 1942 and was elected to the U.S. House of Representatives. He was a member of the Foreign Affairs Committee and in 1943 the House adopted the Fulbright Resolution. This resolution supported international peace-keeping machinery that encouraged United States participation in what became the United Nations; this brought national attention to Fulbright. In November 1944 he was elected to the U.S. Senate and served there from 1945 through 1974, becoming one of the most influential and best-known members of the Senate. His legislation establishing the Fulbright Program slipped through the Senate without debate in 1946. Its first participants went overseas in 1948, funded by war reparations and foreign loan repayments to the United States. This program has had extraordinary impact around the world. There have been more than 250,000 Fulbright grantees and many of them have made significant contributions within their countries as well as to the overall goal of advancing mutual understanding. After leaving the Senate, he was of counsel to the Washington law firm of Hogan & Hartson and remained active in support of the international exchange program that bears his name. He received numerous awards from governments, universities, and educational organizations around the world for his efforts on behalf of education and international understanding. In 1993 he was presented the Presidential Medal of Freedom by President Clinton. Senator J. William Fulbright died on February 9, 1995 at the age of 89 at his home in Washington, D.C.